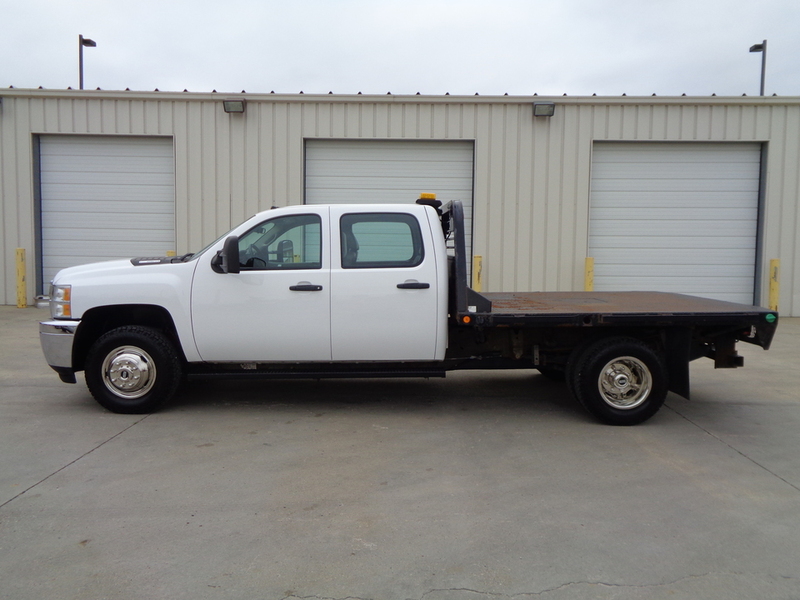 Come Check out this 2014 Chevrolet Silverado 3500 Flatbed Crew Cab Diesel DRW ( Dually )at AutoDrive Inc!! This 6.6 Liter V8 engine has 71,252 miles on it. It has grey vinyl interior with a vinyl floor. It has power locks, power windows, heated mirrors, AM/FM radio, CD player, Auxiliary port, and trailer controls. This is the owners personal truck. I has been used to transport cars and truck for the dealership and hauling our Race car trailer. It runs perfectly, no issue, no problems. Tires are about 70% tread remaining. The Flatbed on this truck has some surface rust, but the cab chassis is perfect. NO rust, damage or issues. This is a great Hauling truck. This has a 5th wheel attachment with a tow hitch as well. Plus this unit also has the Chevrolet fleet mudflaps to prevent from kicking up rocks and dirt. Also included is an under the bed storage box which is very convenient for any storage needed for on the go. In beautiful condition, We even put in brand new Weather Tech all weather floor liners. We consider anything for trade and can help with financing with approved credit from our local lenders. If you have any questions, please call our office at 515-955-3399.